Check Out Our Jackbox Games Stage Schedule for TwitchCon 2018! Have you heard? Just like in prior years, we’ll be back at TwitchCon in full force. Join us at the Jackbox Games stage (Booth 832) in the Expo Hall anytime between 10 AM – 6 PM PST on Friday, October 26th, Saturday, October 27th, and Sunday, October 28th. We’ll be playing new games from The Jackbox Party Pack 5 with some of your favorite streamers! 1:00 PM – 2:00 PM PST: IamBrandon, Havok, & more! 11:00 AM – 12:00 PM PST: Kate Stark & friends! 5:00 PM – 6:00 PM PST: The Jackbox Games “Sunday Blursday” Hour with Warren, Ryan, Brooke, and more! Not attending TwitchCon this year? We’ll be streaming from our stage throughout the event. Follow us on Twitch to be notified when we go live. Keep an eye on our Twitter and Instagram pages for behind the scenes pics and updates from TwitchCon 2018! Oh, hello! Your car couldn’t have broken down in a more fortuitous spot. I mean, what are the chances it would happen over these road spikes outside my house? I was hoping to get a few more guests for this night of Jackbox party games! It must be fate! Quick, come in from the rain! The storm is supposed to last for hours and there are so many spooky and delightful games we can play. One does not need a cavernous mansion like mine in order to create a chilling eve of ghoulish giggles and horrific puns. All you need is Jackbox Games and a strong stomach (because of the sheer number of belly laughs)! Haha what?! NO, that’s not a corpse in the corner! Quick, look at these games on the TV screen! This terrifying trivia game is hosted by a deranged serial killer—which is definitely not a role I can relate to whatsoever. You are a kidnapped contestant who’s forced to participate in a sick and demented game show. In order to survive, you’ll have to demonstrate both book smarts and street smarts. If you get a question wrong, you are dragged to the Killing Floor, where you fight for survival in a variety of cutthroat mini games. What’s scarier than being chained up in a dungeon? Being stuck in a nebulous void. In this game of bizarre hypothetical scenarios, you create unworldly situations with the goal of splitting the room’s response. You hold the power as your force your opponents to play out terrifying (but amusing) scenes. Anything is possible in this multidimensional party game; it’s only limited by your creativity. And isn’t your imagination the scariest place of all? This party game combines two of the scariest things in the world: monsters and online dating. Monster Seeking Monster is a strategy game where you try to woo your fellow creatures of the night via text messages. But be careful who you date. Every monster has secret skills that can harm your chances of winning. Let’s just hope your romantic messages are enough to make an invisible person visibly blush. Sure, these Jackbox staples might not seem like the spookiest games on the surface, but you clearly haven’t played them with user-generated content! Use these codes to access custom Halloween episodes of Quiplash 2 and Drawful 2! Yes, you have the ability to create Halloween-inspired prompts for both of these games! For example, what would be your Quiplash 2 response to the prompt: “Worst thing to say while stuck in some creepy guy’s mansion”? Or how would you draw something like, “Guest unable to leave some creepy guy’s mansion”? ….both of those prompts are a little bit sinister, but very relevant to your current situation. Pick up one of these games to enjoy during your Halloween party now. 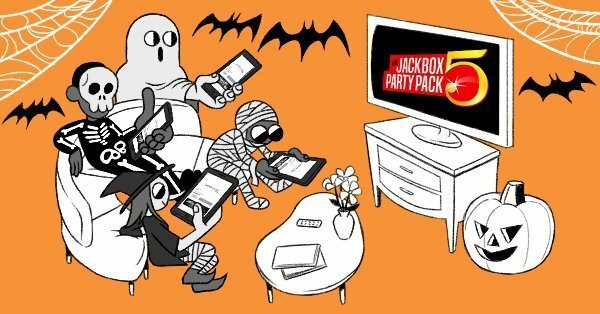 And don’t forget to purchase The Jackbox Party Pack 5 when it is released on all major digital platforms on October 17th! We’re only one week away from the release of The Jackbox Party Pack 5 on major digital platforms. All week, we’ve been revealing trailers for the individual games in the new pack. Pre-order The Jackbox Party Pack 5 for PC/Mac/Linux here. If you pre-order now, you’ll save $5. You’re all set to party on October 17th! Follow us on Facebook, Instagram, or Twitter to learn more about launch updates, streams of The Jackbox Party Pack 5, and giveaways. Join us on October 17th for an extra-long “Launch Day Marathon Stream” of all of the games in The Jackbox Party Pack 5. We’re playing the new games from 12noon CT – 7 pm CT. Tune in on Twitch, YouTube, Mixer, or Facebook Live. Only a little over a week to go until The Jackbox Party Pack 5 launches on major digital platforms! Zeeple Dome and the rest of The Jackbox Party Pack 5 will be released on major digital platforms (including PS4, Xbox One, Nintendo Switch, Steam, Comcast Xfinity, and Apple TV) on Wednesday, October 17th. Save $5 by pre-ordering The Jackbox Party Pack 5 for PC/Mac/Linux here. Let us know what you think of this trailer on Twitter, Facebook, or Instagram using #jackboxgames!